Posted on January 14, 2017 at 5:02 pm. Looking to make your backyard a little more friendly to nature’s creatures? With little more than some fallen branches and logs, you can provide shelter for birds, rabbits, dragonflies, and many other animals right in your own yard! If you have a garden, you can choose to build your brush pile close by, so that your plants will reap all the benefits of your pile. You can also build your pile strategically within eye shot of a window you frequent. That way, when you are sitting or walking by it at home, you’ll be able to look out the window and enjoy the view of the birds, butterflies, and other beauties! Don’t build them too close to your house or your neighbor’s house. To build a strong base, lay down large logs criss-crossed. Create runways and spaces big enough for a bunny to fit through. You can also add stones to your base and, if you have any pipes, you can add these to your base too to serve as tunnels. Pile large branches loosely on top of the base. Continue building in successive layers Gradually add smaller branches and start creating a denser weave. Make sure to leave open pockets between the layers. You can plant native flowers and vines near your brush pile. Flowering and/or fruiting vines will not only sprawl over the pile, making it look a little more beautiful, but will also attract hummingbirds — win win! 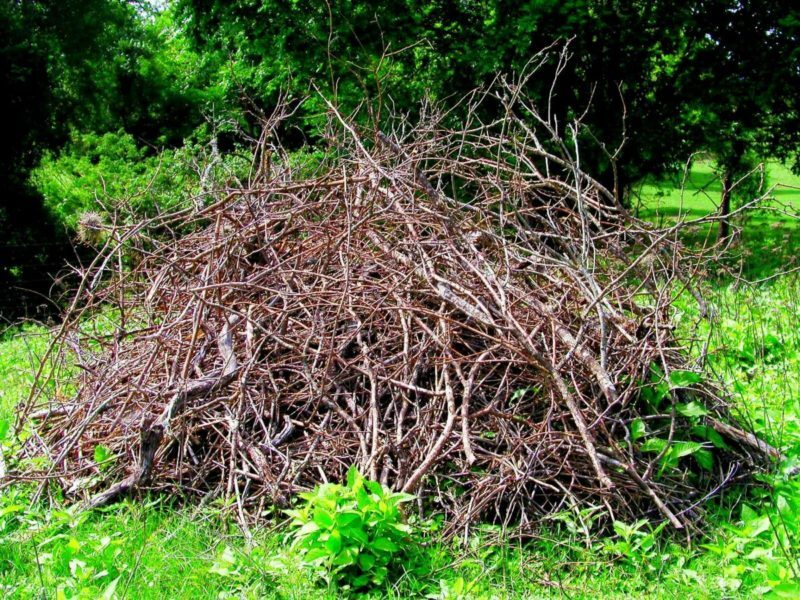 Typically brush piles are about 4 to 8 feet tall and from 10 to 20 feet in diameter, but you can make yours smaller (or bigger) — it’s up to you! You can weave evergreen branches into the shelter to provide better cover from snow during the winter months. Remember to leave those leaves. Leaf layer will provide food and habitat so several wildlife species, and will up your soil quality as well! If you decide to add plants to your brush, plant native species! Grape vines, honeysuckle, and trumpet creeper will make a nice cover — or how about a boarder of wildflowers? Maybe plant a blueberry bush nearby? Go wild! Just remember to choose native plants! Inspect the piles about once a year, to make sure everything is going as it should. Remember, rot and decay are not only normal, but a desired part of the process! You’re just checking to make sure the state of these are not SO much that you need to build a new brush pile.